Over the last 6 months, the cream of Central Scotland’s players have been rehearsing in secret. Now they’re ready for their debut performance as The Bairns’ Big Band. 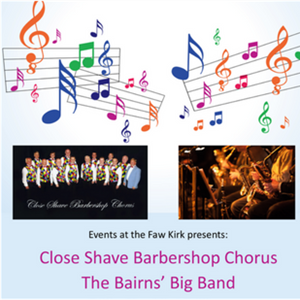 Also performing is top Glasgow barbershop ensemble ‘Close Shave’. This should be a night to delight all music lovers with everything from The American Songbook, through Doo-Wop to Pop and Jazz Funk. Tickets are £10.00 from See Tickets and funds raised will be donated to The Vine Trust project.